In the world of skin care, the new kid on the block is charcoal. This odd ingredient has incredible detoxifying, clarifying, and pore-reducing properties. The best reviewed charcoal cleansers are over $15 and the highest rated, Boscia's Detoxifying Black Cleanser, is a whopping $28! I was desperate to find something within my budget. 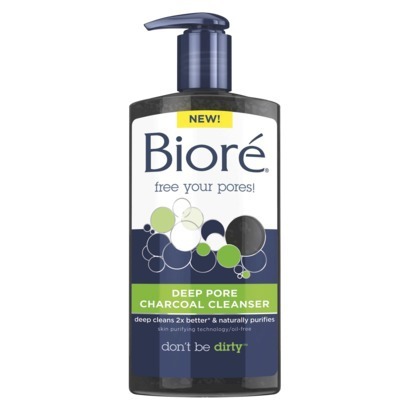 I came across a $1 off coupon in my assortment of junk mail for Biore's Deep Pore Charcoal cleanser. I decided to pick up a bottle ($6.49 at Bed, Bath & Beyond's in-store Harmon) while visiting my boyfriend in Long Island last weekend. I used it that night and I was so surprised by how clean-feeling my skin was that I had to make him feel my face...and he agreed. My skin was cleansed without that tight, dried out sensation. In fact, my skin felt moisturized and upon waking the next morning, the feeling remained. The cleanser itself is black in color but foams up white, and washes away completely, leaving no residue. I've been using the cleanser for a little less than a week and my skin is soft and smooth, my pores are clear and my acne is reduced! I've received these great benefits without any dryout or adverse effects, especially since I have been using it in combination with my other skin care products. I would definitely recommend giving this newbie ingredient a try. Thanks for checking out my most recent post! Follow along on social media via Facebook, Instagram & Pinterest!